We offer high quality Paper Barrels for pen manufacturers. We are looking for queries from Delhi, Ncr. 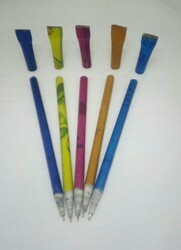 Without plastic , plantable paper pen , customization available. Evergreen ball pen with black glossy finish with chrome trims. An Ideal executive pen comes with Blue insta flow neotec refill to match style with the writing comfort. Packed in an attractive gift presentation. Green-O-Tech India offering EcoPen manufactured with premium quality of recycled paper. We will customize the same as per the requirement of clients by printing logo or punch line on the same. We supply Advertisement Pens. Our expert designers and craftsmen have crafted a silver ball Pen with a contemporary look and stylish finish. With its distinctive round barrel this writing instrument has a fashionable satin chrome clip and trim to complement modern jewellery and accessories.